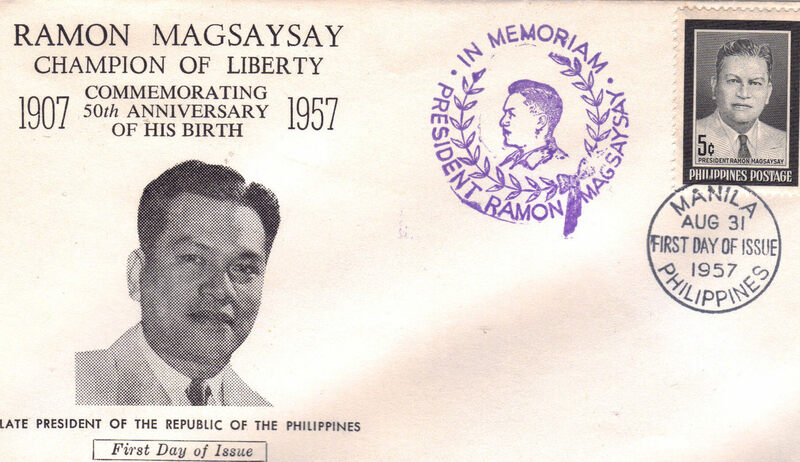 This is the original, official First Day of Issue Honoring the Late President of The Republic of The Philippines, RAMON MAGSAYSAY, Champion of Liberty in commemorating the 50th anniversary of his birth, 1907 to 1957. Issued in Manila, Philipines 8-31-57, stamped as well. Measures 6-1/2" L x 3-5/8" H Some discoloration due to age and storage otherwise, in exceptional condition. Send email if you need additional details. Buyer is responsible for 1.95 shipping to anywhere in the USA Canada. Send email for international rates. Do check the store for many more Las Vegas Collectibles daily. Thanks for stopping by!